Another year has come, and we will continue to soar high as we give you the phpFox 2018 Plan. Welcoming a year with a bang by releasing the latest stable version of phpFox version 4.6.0 is just the beginning. This year, phpFox will give you the most powerful social network software ever. So buckle up and enjoy the ride. Last year, we started porting out the core apps from the script, and they are now available in the phpFox store as standalone apps. Porting out apps from the core script is one of the big steps for this year’s bigger plan. Optimization: The primary objective of porting out core apps from the script is to refine the phpFox core itself easily. Refining the phpFox core will absolutely optimize the software’s performance. Besides, ported apps are now easily maintainable more than how it was before. Performance and Security: One of our plans this year is also to improve the performance and security of the core script. We will dig into the core to do necessary actions to maximize its performance and integrate all the levels of security. API Implementation: Here’s the big thing. phpFox is planning to implement API into the core script. This API Implementation will give you the power to integrate your site with other platforms. Feature Improvements: we will keep upgrading phpFox with some minor releases (4.6.x) to add more feature improvements and fix issues (if having any). We already started the development of the new phpFox store. Our target is to bring up the new store this year. You can take a look at the Sneak Peek to preview the new layout of the phpFox Store. As you know, we mentioned in our 2017 Year In Review that we started the development of the mobile app. And that is one of our projects this 2018. We are going to bring you the very first phpFox native mobile app. While everything else’s being done, we will also upgrade our standalone apps for better user experience. Aside from the ones mentioned above, we will also provide you great documentation for your guidance. We will give you some “How to” articles and new video tutorials on our Youtube channel. Now all you have to do is to prepare yourself to take off as we fly together to the future of Social Network. Just make sure to follow our Social Media channels to keep you updated. You can follow our Instagram, Twitter and Facebook Page. 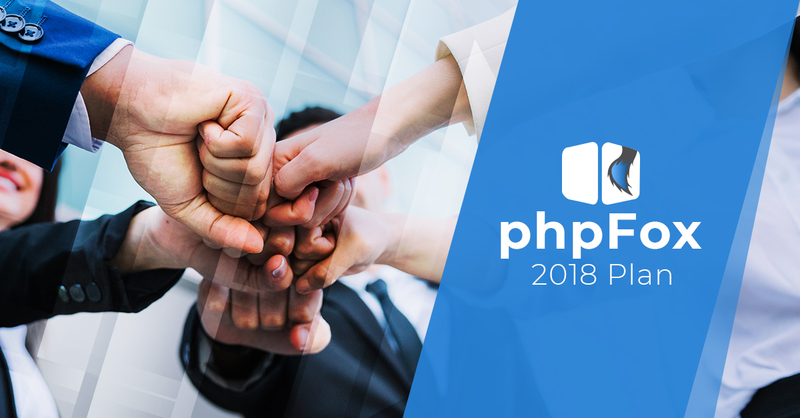 Finally, you can contact us via our email hello@phpfox.com or by chatting with our live chat agent on our website for questions related to this phpFox 2018 plan.